Starmobile is doing a good job on offering us the latest and competitive gadgets at reasonable plus the quality and provided support. Starmobile is set to release another gadget on this first quarter of 2014, it’s the new Engage 9i tablet that is powered by Intel processor. After being the first local brand to offer an Octa Core Phone (runs on 8-processor), they now again claimed to be the first to offer the new Intel Atom Z2580 Clovertrail+ platform. Just like what I said on the previously covered Intel powered tablet from Cloudfone called CloudPad 800W, being attached to a known international brand is a boost on local market presence. This gives your targeted customers a trust on the products that you are offering and the worth of the money they spend. Seeing the specifications of Engage 9i tab makes you excited with Starmobile next offer. From powerful cores they now built this tablet with improved chipset and packed with good features that could match your friend tablet from a known brand. 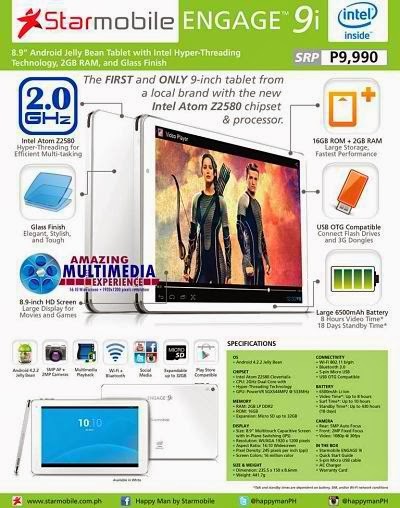 I can say that this is one of the best local brand tablets by just looking at the specs sheet only. From Intel processor to its display that set to full HD, you can really appreciate every feature this tablet has. Engage 9i screen size is a perfect match on the resolution plus the IPS feature that add colors on viewing your tablet in any angles. This tablet doesn’t have a SIM slot but you can still connect to any wireless cellular network with the use of OTG cable support. Just load your broadband SIM then register to surfing promos and plug it in on the tablet. As easy as that, you can still connect to the web without connecting to a Wi-Fi hotspot.